PE4486 type N female right angle 4 hole flange terminal connector has an interface type of solder cup and a 50 Ohm impedance. 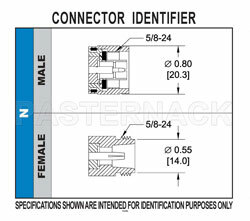 Pasternack type N female 4 hole flange connector uses shield/contact solder as an attachment method. 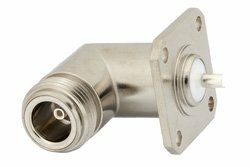 Our female type N right angle terminal connector provides a minimum frequency of DC and a maximum frequency of 12.4 GHz. The Pasternack right angle N type female 4 hole flange terminal connector has a ptfe dielectric type. The Pasternack N type terminal connector has a brass body with nickel plating. Our PE4486 N typeright angle connector uses beryllium copper contact. This type N female right angle 4 hole flange terminal RF connector is RoHS and REACH compliant. This Pasternack right angle female type N 4 hole flange connector will ship the same day as purchased. Our 4 hole flange N type right angle female connector is part of over 40,000 RF, microwave and millimeter wave components in stock for worldwide shipment. We also build custom type N connector cable assemblies that will ship the same day as well.